Residents of the Palestinian village of Duma in the occupied West Bank are forming voluntary groups to guard against attacks by Israeli settlers, days after a deadly arson attack left an 18-month-old resident burned alive, locals said Saturday. The groups — formed on voluntary participation — will patrol the village and its outskirts 24 hours a day, seven day a week to prevent further attacks by extremist Jewish settlers, Duma resident Samir Dawabsha told Ma’an. 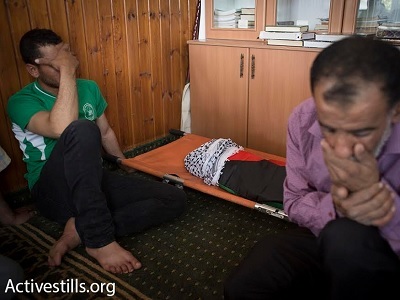 On Friday, Israeli settlers set two Palestinian homes ablaze in the village outside of Nablus, killing Ali Saad Dawabsha, one-and-a-half years old, and leaving his parents and four-year-old brother in critical condition. While the Palestinian Authority security services said Saturday it would do everything in its power to crack down on terrorist acts carried out by settlers, the PA has no jurisdiction over Israelis living in the West Bank. Violent acts carried out by Israeli settlers often occur in the presence of Israeli military who rarely act to protect Palestinian residents and few options for their personal security remain. While Israeli forces will detain a Palestinian in the occupied West Bank for possessing a knife or gun, Israelis living in the same area are legally able to carry such weapons. Samir Dawabsha, also the general director of the Palestinian ministry of local governance in Nablus, urged Palestinians across the occupied territory to prepare plans for self-protection. Samir added that the parents of Ali Saad Dawabsha are still in critical condition but that their four-year-old son Ahmad is beginning to show signs of improvement. PA security spokesperson Adnan Dmeiri warned that Israel would deal with the Dawabsha case just as indifferently as they did with other crimes committed by settlers. Dmeiri pointed to the high numbers of terror attacks carried out by settlers, noting that 23 mosques and a number of churches were torched by settlers in the last two years. “Has the Israeli government handed a single sentence to them? Has the government demolished any of their houses?” Dmeiri asked. “It is a political issue, and if Israel was willing to arrest them [the perpetrators], it could have done that quickly, but the Netanyahu government needs their votes in elections, and this government is dealing with the Palestinians as election bargain chips,” the spokesman added. The suspects in Friday’s arson attack have yet to be identified. While Israeli leadership declared a crackdown on extremist settler attacks in May 2014 following price-tag attacks on Vatican offices in occupied East-Jerusalem, little action has been taken since. The perpetrators of violence against Palestinian civilians and their property — both inside of Israel and the occupied territories — are rarely punished, with police closing the majority investigations without an indictment.